“Experts of the World Health Organization and experts of maternal and infant health said that the health of mothers and infants during childbirth in Cambodia causes much concern, and this is the result mainly of the shortage of midwives. “He continued that there are three major reasons that makes the death rate in Cambodia so high, which include the late detection and control of illnesses, and the late referring to special care. As for other countries, their services are faster. He added that the delays are because there is a shortage of midwives, and most Cambodian citizens do not understand the importance of health centers. “Dr. Cheang Konitha said that according to the national health statistics in 2007 in Cambodia, there were only 3,184 midwives, and this number is not enough to guarantee the safety of mothers and infants during childbirth. “She said that there are more than 100 health centers that have no midwife at all, and 78% of women give birth to their children at home, 55% of whom give birth assisted by traditional midwives who have not obtained training in midwifery skills. “Mr. Kum Kanal denied the numbers describing the shortage mentioned above, claiming that because of the efforts of the government, so far, among all of the more than 900 health centers in Cambodia, only 72 or 73 centers do not have a midwife. However, he admitted that Cambodia still lacks thousands of midwives, but he is not sure about the real number of the shortage. “Officials of the Human Resource Development Department of the Ministry of Health could not be reached for comment on 28 June 2008. “Ms. Cheang Konitha said that as a national standard, each health center needs one to two midwives. As for hospitals that have three sections, some need six to eight midwives, or seven to ten or fifteen to twenty; and areas without health centers also need midwives. “Regarding the shortage of midwives in Cambodia, regional experts of the World Health Organization said in a workshop organized in Hanoi that the reason for the shortage of midwives in Cambodia is an economic problem. “Mr. Kum Kanal mentioned that this is the true reason; the low salary is the major reason, and the shortage of encouragement is also a cause. Young people of the next generation in their teens are not very much interested in this skill. Have a look at the last editorial – Preah Vihear still in the headlines – more informaion from Thailand and Cambodian documentation. The fact that I am still in Thailand provided me with the special opportunity to observe also what is happening in the Thai media – in newspapers and on TV. First some special events, which received quite some attention, and some included court actions. The secretary-general of the Office for the Prevention and Suppression of Corruption in the State Sector was accused to have insulted the former ousted prime minister Thaksin Shinawatra, and after he had refused to appear before the police, an arrest warrant was issued – which was finally overturned by an Appeals Court. The chief of the National Police was was removed from his position, and a brother-in-law of the former ousted prime minister was moved to the position of deputy police chief, so that the would become the next chief of the police. The board of Thai Airways International dismissed the president of the airline, and wanted to replace him with an executive vice-president (who happened to be a former classmate of former prime minister Thaksin Shinawatra in the Armed Forces Academies Preparatory School) – but after protests from employees who saw this as a political ploy, the chairperson of the board reversed the board decision on the same day. The Public Health Minister had dismissed the chairperson of the board of the Government Pharmaceutical Organization, who had been a key advocate of “compulsory licensing” – a legal practice by which governments can, under certain conditions, initiate the production of medical drugs patented in other countries – for essential drugs against AIDS, cancer, and heart diseases, resulting in some cases in prices of only one tenth of the imported products. But this is neither welcome by foreign companies producing, nor by national companies trading in the more expensive drugs. The Administrative Court ordered the reinstatement of the former chairperson of the Government Pharmaceutical Organization. He had been replaced by a former manager of the national football team. – It is remembered that the ousted former prime minister controls the Manchester United football club; he is also the chairperson of the Golfers Association of Thailand. Three lawyers of the ousted prime minister were jailed for six month by the Supreme Court for attempted bribery and contempt of the court. They had visited the court to discuss when the former prime minister and his wife would appear at the court, and when leaving, he lawyers left a lunch box with Baht 2 million in cash – about US$60,000 – “for the court officials.” When they opened it, a judge happened to walk by and saw it. The jailed lawyer said he just mistook the box – his wife had prepared some chocolate for the court staff, and he, by mistake, took the other box with the two million. Now the police is investigating where the money came from. I mention these happenings as the have to be seen as a general context for the present political climate in Thailand, where the last week was dominated by a three days debate in parliament – live on TV – about the performance of the government’s first four months in office. The government had at first tried to refuse to put such a debate onto the agenda, but after the Government House had been surrounded by an estimated crowd of 25,000 persons of the People’s Alliance for Democracy, the debate was on. The debate was well organized, with specific subjects to be addressed by the assigned members of the opposition: fuel and rice price policy changes, lack of transparency in government purchase decisions, but the most intensive debate was related to the Preah Vihear temple – which was led by Mr. Abhisit Vejjajiva, the leader of the opposition, questioning the performance of Prime Minister Samak Sundaravej and Minister of Foreign Affairs Noppadon Pattama, a former lawyer and spokesperson of the ousted prime minister. As it had happened before, the question was raised whether the final Cambodian-Thai solution is related to the meeting for a party of golf between the former Thai prime minister after he was ousted, and the Cambodian prime minister in Siem Reap – but any relations between the two events was denied. While many arguments were exchanged, nobody in this debate questioned the 1962 International Court of Justice decision that the Preah Vihear temple belongs to Cambodia. But a lot of questions were raised about the way in which the present situation was developed in secrecy, about accepting the map proposed by Cambodia relating to the area around the temple complex which isolates the temple from its wider surroundings, and about the implications of the final understandings achieved between the Thai Minister of Foreign Affairs and his Cambodian counterpart, the Minister in Charge of the Council of Ministers. The 1962 International Court of Justice decision was reprinted in full in the press, as well as the different maps – old and new. Though I am at present not in Cambodia, I inquired with several contacts, but I got the impression that newspapers in Cambodia have not made the 1962 decision of the International Court of Justice available. The original is in English and French, and I was not able to find any reference to a Khmer translation as the basis for the public debate in Cambodia, not in the press and not on the Internet – if they exist, we would be happy to share this information more widely. “Having The Hague Court Verdict, Cambodia Should Not Discuss Anything with Thailand!” – but some sections of the border in the are have specifically not been defined in 1962. 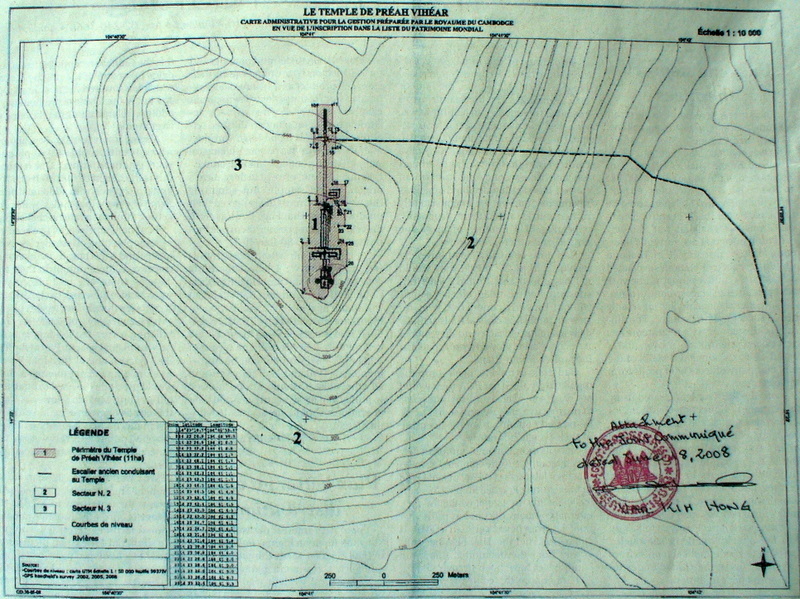 “The Cambodian government seems to fall into a trap of Thailand by listing only the body of the Preah Vihear Temple and the areas which extend 30 meters from the temple” – but this map was submitted from the Cambodian side, and only reluctantly accepted by the Thai cabinet on 17 June 2008. In response to a widely circulated scholarly legal argumentative interpretation of the 1962 verdict by the lawyer Mr. Tuch Bora, presenting his understanding of “Thai’s Misunderstanding of the World Court Judgment of 15 June 1962” – many anonymous aggressive Khmer responses were received, implicating the Thai King who has not spoken on this issue, saying “The Siams are mislabeled by their king who rewrite their history like he see fits” and many more violent ones, one is hesitant to quote. The above was correct at the time of writing – 29 June 2008 – and did provide a direct access to the English version of submission for the proposed inscription in the World Heritage list. It turned out later that the above link did not work any more – the Press Office of the Council of Ministers had made some changes: while the site still says that these documents from some unspecified day in May 2008 ( ឧសភា ឆ្នាំ ២០០៨ ) are accessible here, there is now a selection of documents in four languages available for download. A version of this text in the Khmer language is not published by the Press Office of the Council of Ministers here. In 10 chapters it describes the location, the cultural and legal history, and maps and photos, with the major related documents. It does not contain the text of the Joint Communique signed on 18 June 2008 by Minister Sok An and Minister Noppadon Pattama in Paris, and as witness co-signed by the Assistant Director-General for Culture of UNESCO, nor does it have the appended map, signed and presented by the Cambodian site, showing not only the temple area, but also the adjacent areas 1, 2, and 3, about which the text says “The Kingdom of Cambodia accepts that the Temple of Preah Vihear be nominated for inscription on the World Heritage List without at this stage a buffer zone on the northern and western areas of the Temple.” The map which we presented in the editorial of the Mirror on 22.6.2008 is a graphical representation of this position accepted by Cambodia. The numbered areas are part of the map presented by Cambodia. This information, including the map, are quoted from the Bangkok Post. The coming days and weeks will show what happens next. “Phnom Penh: In recent years, Cambodian women had married foreign men and they were often abused in many different ways, such as through trafficking and exploitation. After many women had married to Taiwan, Cambodian women started to marry to South Korea, and some are being mistreated by their husbands and families. That is why the Cambodian Ambassador to South Korea reacted strongly that Cambodian women are not goods, and he asked to stop the abuse of Cambodian brides. “Mr. Lim Samkol, Cambodian ambassador to South Korea, spoke to the Korea Times – and his words were published early this month – asking South Korean citizens to accept Cambodian brides as new members of their families, and he asked them to try to understand and forgive them for some expressions of culture shock. “He said that Cambodian women are not goods. He said so, because most Cambodian women who got married to live in South Korea were married after Korean men had spent money to arrange these marriages. “Previously Mr. Han Kuk-Yom, the president of the Women Migrant Human Rights Center, had told the New York Times that that government does not guarantee to protect the rights of the Korean men’ wives who are immigrants or to protect them from mistreatment. He said that Korean men believe that they are allowed to mistreat their wives, because they had spent much money to the tourist companies or for the marriage arrangement; and they always look down on women from poor countries. “Mr. Han Kuk-Yom said, ‘Three years ago, women were taught before they were sent to Korea, but now they did not get much education, so they need to spend much time to grow accustomed to their lives in Korea, such as learning Korean and other traditions. “According to the International Organization for Migration, Mr. John McGeoghan said that Korean men seek wives in foreign countries, because they cannot find wives in their country. Most of them are farmers or fisherman, or they have families in rural areas. He added that most men got married through marriage agencies or matchmakers, or by their own arrangements, and they get married with women who are Chinese, Japanese, Philippinas, or Thai; and the weddings are often celebrated in Christian churches. At present, most international marriages are with women from developing countries in the region, such as China, Vietnam, the Philippines, Mongolia, Thailand, and Cambodia. “Mr. John McGeoghan told Khmer Sthapana that the state of being victimized is easily caused by the unbalance of the economic situations that can lead to the exploitation to foreign women by treating them unequally, including discrimination, violence, and the abuse of women’s rights. According to a report of the Ministry of Health and Welfare of Korea, 37% of international immigrant women got fake information about their husbands, including about mental health, 28% got fake information about the income of their partners, 21% lied that they are wealthy, and 20% got cheated by giving fake job information about their future husbands. “Mr. John McGeoghan said last month in the World Vision organization in Phnom Penh that, according to the Ministry of Health and Welfare of Korea, 31% were verbally abused, 26.5% were physically abused, 23.1% were sexually abused, and 18.4% were abused by threats. “According to the index of the International Organization for Migration, the number of brides marrying Korean men increased dramatically: in 1990 there were only 619 foreign brides counted, and in 2005 there were 31,180. According to the Korea Times, there are 2,564 Cambodian women married to Korean men. “Late March 2008, the Cambodian government stopped temporarily all marriages between Cambodian women with foreign men after many irregularities were found. “In May, in a meeting of a working group against human trafficking at the World Vision organization, the Secretary of State of the Ministry of Women’s Affairs, Ms. You Ay, said, ‘Cambodian girls are not goods,’ but previously, marriages to foreign countries had shown irregularities, because they were made not according to the marriage law, and they did not respect Khmer traditions; and the ways in which the matchmakers choose women shows extreme exploitation – Korean men gave them US$15,000 to US$20,000, but the brides got only US$300 to US$1,000. “Khmer Sthapana has contacted victimized women married to Korea and was told that most of the Khmer women marrying Korean men received only US$300 to US$1,000, while the Korean men spent US$15,000 to US$20,000. If women were beautiful, they received US$700 to US$1,000. These women thought that their marriages are like winning a lucky draw and expected that they would be able to send some money home to improve their families’ livelihood. “However Ms. K.S.A. aged 19, in Svay Teab, Chamkar Leu, Kompong Cham, said that her expectation dissolved like water; she was mistreated by her mother-in-law and finally she had decided to return to her country like a widow with a four-month-old child. “As for Ms. V., aged, 23, she told Khmer Sthapana last week that she and her sister live in Rolea B’ier, Kompong Chhnang, and married Korean men last year. Now, she got divorced from her Korean husband, because he has epilepsy and his mother mistreated her. Before the matchmaker had told her that everything was alright. “Cambodia and Korea have cooperated since 1997. Since 2004, the number of Korean tourists visiting Cambodia ranked first. Now there are Cambodian people working and staying in Korea, and the number of Cambodian brides is approximately 2,500. Have a look at the last editorial – it is almost frightening to see to which extent there are strong emotions, disregarding related legal documents. “Kampot: An official of the International Program on the Elimination of Child Labor of the International Labor Oorganization [ILO-IPEC] said on Tuesday, 24 June 2008, that his organization will continue to provide funds for a period of four more years to a civil society network against child labor in Cambodia. “Mr. M. P. Joseph, a technical advisor to ILO-IPEC in Cambodia, announced this during an official ceremony of civil society organizations against child labor, meeting in the Phnom Pros Hotel in Kompong Cham. In this ceremony the provincial authorities, other departments and units, non-government organizations, and many monks participated. “He mentioned, ‘Therefore we all have to join to eliminate all forms of child labor, especially the serious forms. At the same time, the participation from communities, parents, enterprises, factories, and mass media is necessaary. According to a national plan implemented since three years by the government as well as other authorities, there were great achievements. This shows that child labor will be eliminated by 80% in 2015 and will be totally eliminated in 2016. “He went on to say that for the process to eliminate child labor in Kompong Cham, more than US$3,000 per year were spent. ILO-IPECH even wants to create anti-child labor networks at district level in Kompong Cham, in order to make it stronger in other circles and other provinces. “Phnom Penh: After internal wars which had blocked Cambodian education, Cambodia has paid attention to develop it, but the present numbers show that the general situation of the system of education is still poor. This was reported by the Asian Development Bank [ADB] recently. “In this report, issued on 17 June 2008 about the situation of education and strategies for its development, ADB found that many schools, which do not get enough support in Cambodia, have the highest numbers of students per class in Asia, and the rate of students dropping out of school while repeating classes have an average rank in the region. “The ADB report shows that the education system in Cambodia has not reached the global primary education goal. Cambodia is facing failure to achieve the UN Millennium Development Goal for education by 2015. Cambodia gets good scores for the number of students enrolling in primary classes at 92%. This report demonstrates that the rate of students dropping out of school is high, which is the most important problem among many problems making it difficult for the educational sector in Cambodia; the rate of students finishing primary education is just 64%, which is a disappointing number. In Cambodia, students repeating a class is 10%, making Cambodia one of four countries which have high rates of students repeating a class. “The ADB report shows also that there are many reasons making parents to decide to stop to send their children to school. These reasons include poverty, schools are located far from the home, the need to help parents with their work at home or for farming, and the view that schools are not safe in terms of the general situation, and they are not related to the needs of the people at all. Another reason is that teachers have to take care of too many students – a teacher has to teach 56 students in one class in Cambodia, which is the highest rate in Asia; it is higher than that of Bangladesh, where a teacher teaches 55 students, and that of Afghanistan, where a teacher teaches 43 students. “This report states that the teachers’ small salary, and the fact that the state does not highly value the role of teachers in society, as well as the fact that teachers have more tasks than to teach students, make the occupation as a teacher to be less interesting for potential applicants. Process to Arrest the Suspect Chea Ratha Regarding the Acid Attack [on Ms. In Soklida’s aunt] Seems to Be Totally Quiet! “According to the joint statement of 18 June 2008, signed by the Cambodian Deputy Prime Minister Mr. Sok An, and by Thai Foreign Minister Mr. Noppadon Pattama, and Mrs. Françoise Rivière, UNESCO Deputy Director for Culture, about the listing of the Preah Vihear Temple as a World Heritage Site, and a new map that the Cambodian government sent to UNESCO, we found a part of Cambodian territory at the west and the north of the temple (or Area 3) is lost. “The Cambodian government seems to fall into a trap of Thailand by listing only the body of the Preah Vihear Temple and the areas which extend 30 meters from the temple, but do not include the Area 3 which should also have been listed. “According to our own experience from visits with students from different universities in Phnom Penh in 2001 and 2004, we found that the Cambodian government is creating a loss of land, by agreeing to create a new map, especially as it does not include Area 3 as Cambodian territory. Obviously, based on two visits, we found that the loss of land in Area 3 is an obstacle for tourists to climb up to the Preah Vihear Temple from Cambodia, because the areas at the east and the south are extremely steep to climb up and go down. “According to the Deputy Director of the Cambodian Border Committee, it shows that The Hague International Court of Justice in 1962 used a 1:2000 scale map for the Preah Vihear Temple, and that map is being kept at the court. In addition, the French-Siem [Thai] Treaties in 1904 and 1907 show clearly the land border and sea border between Cambodia and Thailand, especially they show that the Area 3 definitely belongs to Cambodia, which contradicts some Thai positions which say that the border at the Preah Vihear Temple is at the steps to the temples. 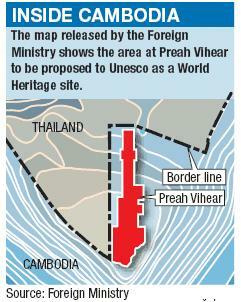 “We agree with UNESCO, working to maintain cultural heritage, but we cannot give up the Hague verdict of 1962 about the Preah Vihear Temple and its area, based on the 1904 and 1907 French-Siem Treaties, especially the listing of land in Area 3 – otherwise Cambodia will lose this land to Thailand. ”We found that Thailand never dared to invade territories of Malaysia or Burma, because the governments of both countries are strongly committed to protect their territories. Only the territory of Cambodia has repeatedly been invaded by Thailand.. Moreover, Thailand never dared to protest officially on the international level; it just tries to make trouble for Cambodia. This shows that Thailand intends to invade Khmer territory and to block the Cambodian economic breath of tourism, absorbed by the Preah Vihear Temple. Remove the new map and use a map from The Hague for the proposal of the listing of the temple. List the Preah Vihear Temple as a World Heritage Site unilaterally. “By the evening of 24 June 2008, the border crossing at the Preah Vihear Temple is still closed, while there are still about 10 Siamese [Thai] demonstrators far from the temple. According to news sources, this closure was ordered by the Khmer Ministry of Interior. This situation might last longer, if there are still demonstrations from Thai nationals. As for the Thai side, it is reported they agree with the closure of the border crossing in front of the Preah Vihear Temple. “The commercial activities at the temple, both by Khmer and by Thai vendors, are reported to be closed down temporarily. However, generally we found that for the Thai side, both sales and other services lost much more than on the Khmer side. Nevertheless, the Khmer side worries about more than 100 families living on the Preah Vihear mountain who depend on business and on selling things on this mountain. People who are members of the soldiers’ and the police’s families ask for assistance from the authorities and the government. There is still nobody who provides assistance to those people since the closure, besides presents brought by journalists for the forces guarding the Preah Vihear Temple since late last week. “Local observers find that the statement of Cambodian Watchdog Council is one thing, but what is more important is that the Cambodian Watchdog Council should try to seek additional assistance for the families of the soldiers and of the police who are facing difficulties. However, they noticed that the Cambodian Watchdog Council seems not to pay attention to the difficulties of the temple’s guards. On the contrary, they benefit from the difficulties of the soldiers’ and the police’s families. “Phnom Penh: Civil society organizations mentioned that fuel prices seem to be higher and inflation remains stable nowadays, and it is assumed that after the coming fourth term parliamentary election, although a new government will be created, it will not be possible to solve these problems. “Mr. Yang Saing Koma, Director of the Center for Studies and Development of Cambodian Agriculture, [CEDAC], told reporters at the Cambodiana Hotel on 19 June 2008 that food prices, which are steadily increasing and are a global phenomenon, push that in Cambodia the prices of all kinds of goods are increasing at the moment. “He added that from August to September, the Cambodian rice price might continue to rise, because farmers might run out of paddy rice from the storage rooms while they at the same time want to sell it, because there is a lot of demand at the market, and domestic supplies are not enough; this will increase the price of rice to be higher, or at least it will remain at the present level. “Similarly, Mr. Chan Sophal, the president of the Cambodian Economic Association, said that the price of crude oil at the international market may further increase in the future. Therefore, the price of fuel in Cambodia is not expected to drop. He continued that inflation gets higher because of two factors – a domestic factor and an external factor. He explained that at the present time, the prices of all kinds of goods at the international market increase strongly because of the shortage of food. As for the domestic factor, there is a group of people who sell land, and they have income from this, but this group also needs domestic materials and food, and because the domestic products are not sufficiently available, the inflation grows higher. “To solve the increase of fuel prices and of inflation, Cambodia could follow the model of Iran, Malaysia, and Indonesia. These countries have created systems to sell fuel or rice by setting two different pricing policies – to sell to the rich at higher, and to the poor at cheaper prices. The sale of fuel to the rich is established for those who drive luxury cars when they go to fill fuel at the gasoline stations. This example was raised by Ms. Chea Vannath; as for Mr. Chan Sophal, he added that the government can reduce the tax on oil imports, and this can reduce the price of fuel. As for inflation, the government has to increase the yields of cultivation, and handle land disputes better. “Observers noticed that nowadays citizens in Cambodia sell land or leave their land unused while they have disputes; these are obstacles to increase the yield of rice in Cambodia. “Regarding this issue, Mr. Ith Nody, undersecretary of state of the Ministry of Agriculture, Forestry, and Fisheries, told reporters at the Hotel Cambodiana on 19 June 2008 that the government knows these problems and has measures to deal with them. The government will provide social concession land to citizens with the support of the World Bank and a Japanese fund by using social land concessions in Kompong Cham, Kratie, and Kompong Thom, but he did not give any details about the size of those social land concessions. “He added that merchants have bought land from citizens and left the land unused. The government, when necessary, will require those merchants to pay land taxes to the state. “Last Friday, Khmer Sthapana had tried to phone to ask for some explanation about the continuing rising price of fuel from the Senior Minister of Economy and Finance, but could not reach him. “However, Mr. Keat Chhon has told reporters a few days ago that the government has prepared approximately US$30 million to spend this year quietly and has tired to prevent inflation, which is a phenomenon in foreign countries, to keep the price of fuel from increasing further. “Phnom Penh: The Permanent Committees of the National Assembly and the Senate, and the Board of the Council of the Legislature Assistance Project supported by the United Nations Development Program [UNDP] held a meeting on 20 June 2008 at the Senate to consider the monitoring of the implementation of the Legislature Assistance Project supported by UNDP. “Samdech Sisowath Chivanmonirak, the First Vice-Chairperson of the Senate of the Kingdom of Cambodia, said that now, the Cambodian Senate starts to implement a three-year Legislature Assistance Project (2008 to 2010), which had been agreed upon officially by the Cambodian National Assembly and UNDP on 15 June 2007. “He said that the Legislature Assistance Project was designed to support the strengthening and the increase of the capacity of nine departments in order to implement their duties more effectively: representation, legislation, and oversight. This project also focuses on strengthening the capacity of the General Secretariats of both parliaments to be able to provide their services more effectively to the members of the two parliamentary bodies. “Mr. Um Sarith, the Secretary-General of the Senate and the Deputy Secretary-General of the Technical Coordinating Secretariat, said that for the Legislature Assistance Project, both parliaments have mutually agreed to create a Technical Coordinating Secretariat to coordinate the work between the project development partners and the legislative institutions. This secretariat has begun its activities already since January 2008, based on a joint decision of the National Assembly and the Senate, numbered 017 P.R, dated 22 January 2008, and the secretariat is located at the National Assembly. “Also Mr. Leng Peng Long, the Secretary-General of the National Assembly and the Head of the Technical Coordinating Secretariat, presented an action plan that will be implemented from July to December 2008. “Mr. Leng Peng Long presented the action plan of the Legislature Assistance Project supported by UNDP for the implementation in the second quarter of 2008, in which he stressed two potential goals which are planed to be implemented: 1. Strengthening and broadening expert committees to fulfill relevant work more efficiently (in drafting laws and in monitoring law enforcement, and the position of representatives), 2. Strengthening the Capacity of officials of the General Secretariats of the parliaments to provide effective services to the parliaments, as well as to develop the Technical Coordinating Program. This time I write from Thailand, where I have to spend some time in a hospital. So I read every day two Thai newspapers, both published in English. And every day there is something about Preah Vihear. Thailand is in deep political trouble again. The People’s Alliance for Democracy – one of its leaders is the popular former mayor of Bangkok, retired Major General Chamlong Srimuang – is demonsstrating since weeks. Finally, on Friday 20 June 2008, about 25,000 people surrounded the Government House, demanding the resignation of the prime minister. The secretary-general of the Office for the Prevention and Suppression of Corruption, Mr. Sunai Manomai-udom, had been called by the police for an investigation, being accused of having defamed the former, ousted prime minister Thaksin Shinawatra, as he had insisted to continue investigations of alleged corruption, but he refused to present himself to the police: “I have fought this practice of abuse of power, to establish that the use of state power must be within the law, and those who have the power cannot use it against any individual.” I response to his refusal to present himself to the police, an arrest warrant was issued to detain him – but this warrant was thrown out by the Appeals Court. There are difficult discussions in the press about non-transparent purchases of firefighting trucks, and the plan to lease one hundred buses for Bangkok, without public bidding. More than sixty of the 200 senators filed a complaint with the National Counter Corruption Commission against the prime minister, after the government refused to answer their questions, though this group of senators point to Article 275 of the Thai Constitution which obliges the government to respond. And the foreign minister, a former adviser of the ousted former prime minister, is accused to have negotiated the Preah Vihear issue in a not transparent way with the Cambodian side, not publishing details – while some critics see a connection with the meeting for playing golf between the ousted Thai prime minister with the Cambodian prime minister, after which plans were published that Mr. Thaksin Shinawatra would invest millions of dollars to create gambling casinos in Koh Kong – and both governments agreed how to present the Preah Vihear case to the next UNESCO meeting on World Heritage Site listings. This is one complex of actual problems which should be known when considering the background of present discussions in Thailand. But reading the Thai newspapers regularly, I became also aware of another complex, some historical and legal information, which I had not been aware of while in Cambodia. Maybe it is only my mistake that I was not aware of these points – or maybe the Khmer press and the Khmer public is not so aware of these points. First the history – the history before the 1962 ruling or the International Court of Justice in The Hague. I did not know before how the border between Cambodia and Thailand in that region had been drawn. The French colonial power in Indochina began in 1904 do make a clear map delineating the Cambodian-Thai border, drawing the line along the watershed along the Dangrek Mountain range. The following map, finally released after public criticism during the week, shows something interesting: the border is drawn according to the blue lines which indicate the elevation of the territory, always following the watershed, as jointly decided in 1902 and later confirmed in 1907 – but only in the region of Preah Vihear the border is drawn differently. When Cambodia claimed Preah Vihear at the International Court of Justice, Cambodia was supported in its claim to the temple, but as it was not clear how the principle of the watershed as the border had been changed, the International Court of Justice declared that the area around the temple has to be negotiated and clarified between the two countries. These uncertainties had never been solved. The UNESCO World Heritage Committee meeting from 23 June to 2 July 2007 did not take a final decision because of the lack of clarity about the surrounding area, and asked that Cambodia should present a Progress Report to the World Heritage Center by 1 February 2008. I am not aware that this report was ever referred to in the press – and I offer my apologies if it was and I missed it. That the temple belongs to Cambodia is not disputed by the Thai authorities. But it is questioned in the Thai press how the present agreement can be practically implemented. According to the explanation by the Thai foreign minister, the map was presented by the Cambodian side and accepted by the Thai side. It claims only an area of 20 to 30 meters around the temple as belonging to the temple, and after a limited transition period, all the Cambodian tourism facilities and the access to the are from Thailand, which are beyond this line, will have to be removed. Having The Hague Court Verdict, Cambodia Should Not Discuss Anything with Thailand! The area of about 4.6 square kilometers, within the watershed area on the Thai side, minus the temple and its 20 to 30 meter surroundings, remain contested. They have not been given to Cambodia in 1962. In view of this situation, the Thai Senate Committee on Foreign Affairs is reported to ask the World Heritage Committee to delay a decision further, as any decision by the Thai government, that would affect the territorial integrity of the country, requires, according to Article 190 of the Thai Constitution, an agreement by parliament. The Thai government has not considered this to be necessary, as it considers the agreement between between Thailand and Cambodia on the nomination of the temple as a World Heritage Site not as a “bilateral agreement” and therefore should not need parliamentary approval. All things considered, an future amicable agreement with Thailand, to whom a good part of the 4.6 square kilometer of the contested land on the Thai side of the watershed should belong, is indispensable for good neighborly relations. The memory of the attack on the Thai embassy in Phnom Penh in 2003, and the destruction of properties valued at US$56 million – the mutually agreed material price – which happened on the basis of a baseless lies and rumors, and the fact that nobody has been punished in Cambodia for these acts of vandalism, is remembered again, and hope is expressed that a rational considerations of the historical and legal facts will prevent further damage. “Although donor countries have detailed development plan of the country, but as nowadays a mechanism for the elimination of corruption in Cambodian society is not yet in place, Khmer poor citizens face difficulties in the health sector. Recently, the World Bank has proposed health sector reform strategies to develop the health sector in Cambodia. Though there were hundreds of millions of dollars spent since 1996, there is still no noticeable focus on Khmer poor citizens from state institutions. Although the health sector improved somewhat, Khmer poor citizens are still seriously affected by discrimination, and the requirement to pay money for different services. “The World Bank has approved to provide a credit of US$30 million to support the implementation of the Cambodian 2005-2015 health sector strategies. These strategies aim to promote preventive health and heath services for Khmer citizens, especially focusing on women, children, and the poor. “This credit will be used to provide financing for the Second Health Sector Support Program, and in a period of five years, this program will receive a total credit of US$120 million from six development partners. As for the World Bank, the credit will be provided to the International Development Association [IDA] which is an agency of the World Bank that is in charge of providing supports to the world’s poorest countries. A part of the aid will be provided from the Department for International Development [DFID-UK], AusAID [Australia], UNICEF, the United Nations Fund for Population Activities [UNFPA], and the Agence Française de Développement [AFD]. Also, other development partners expect to join this program during the implementation process. “The Second Health Sector Support Program will use the health plan of the Royal Government of Cambodia and its mechanisms to observe the results and to share the management of the program jointly, and to allocate the resources as a joint package. This program had been organized to help Cambodia to improve its health situation through strengthening the capacity and mechanisms of its institutions that help the government and the development partners, and it can guarantee achievements in the health sector to be more efficient and more effective than before. “The Second Health Sector Support Program will increase available resources to ensure the promotion of the health of mothers and children, as well as to contribute to deal with new heath problems, such as injuries and chronic diseases. This plan promotes the quality of training of health professionals, including midwives, and strengthens health service delivery at heath centers and referral hospitals. This program also helps the government to become a helper in health systems. Many poor citizens will benefit a lot from this program, because this program aims to expand the supports for Health Equity Funds in order to help poor citizens to have the opportunity to receive major health care and preventive health care. This program also assists civil society organizations in making health plans at the local level, and in observing the provision of services.